Hi, friends … I’m baaccckkk!!! 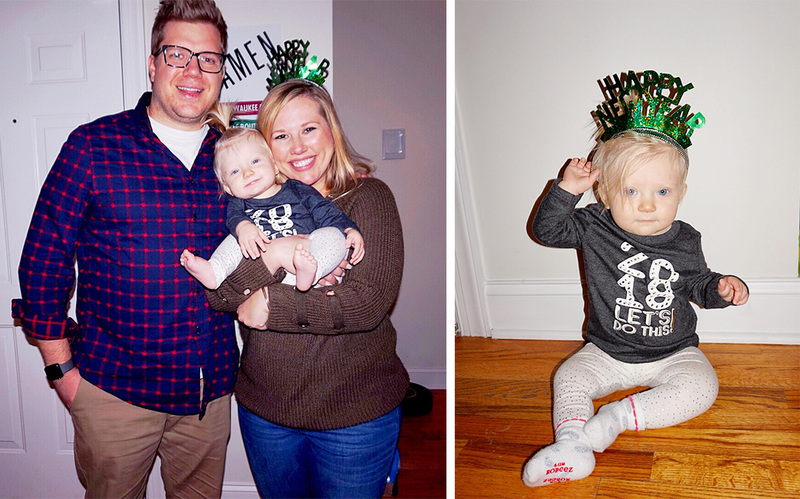 Happy, happy new year! I know I’ve been pretty MIA here lately and I hate it, but life has been SO busy that I haven’t had the time to sit and write. I’ve been soaking in as much family time as possible and enjoying my little hiatus, but I am so happy to be back here, writing and sharing with you again. Since I’m so backlogged and I have a TON to catch you up on, I’m going to start with a new “Life Lately” series, where I’ll give you little life updates as they happen. Consider it a little sneak peek into my personal life (through LOTS of pictures). This update covers Christmas and pretty much the entire month of December, so turn on your favorite Christmas tune (I suggest NSYNC’s “Merry Christmas, Happy Holidays” or Hanson’s “What Christmas Means to Me”), put on your favorite tacky sweater, and grab a cup of egg nog … here we go! 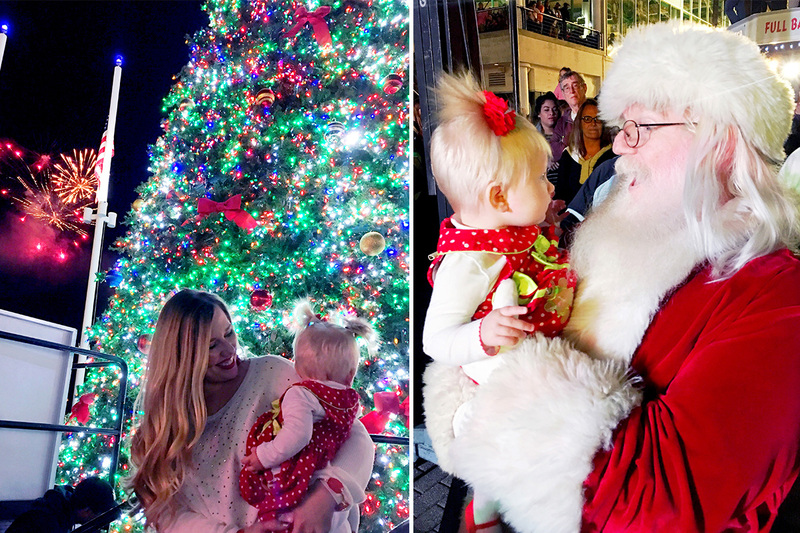 We kicked off the holiday season with the Tree Lighting Ceremony at the Jacksonville Landing the day after Thanksgiving. 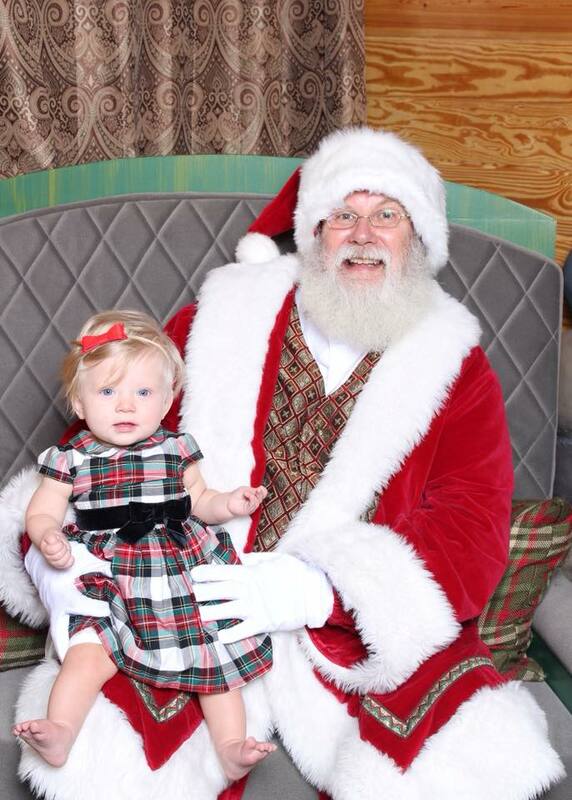 This is always my favorite night of the year here in Jax, but it was extra special this year having Daisy with us. We enjoyed food and cocktails at the VIP party, and sat beside the stage (and right beside Santa!) for the event. Daisy even got to go on stage with Santa to help light the Christmas tree! It was magical. If you’ve never been to this event, mark your calendars for this year! Of course we did every festive thing possible over the next few weeks … decorated the house and our tree, took Christmas card pictures, sent out Christmas cards, hung Christmas cards, looked at lights, made way too many cocktails and sweet treats, read every Christmas story, sang every Christmas song, attended Christmas parties and festivals, had breakfast with Santa, hosted our annual tacky sweater party, took Daisy to see Santa (twice), and watched every Hallmark and Lifetime Christmas movie. Have a mentioned we’re Christmas junkies? 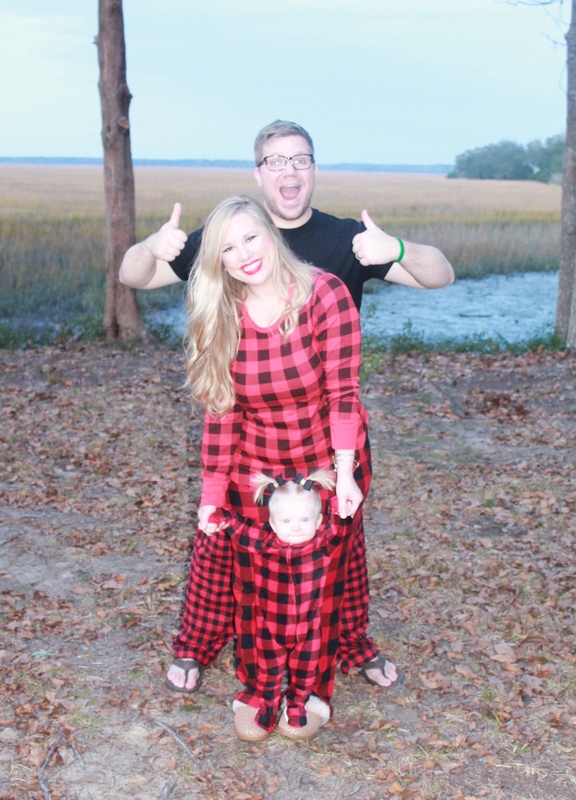 Christmas weekend rolled around, and we headed to Savannah to celebrate with my fam. Saturday, we had our annual celebration at my dad’s, which was wild and crazy and super amazing, like always. My two brothers, sister, their spouses, four nephews, four nieces, aunt and two cousins, my dad, Jimmy, Daisy and I all piled into my dad’s little river house for a pajama-themed evening, ate tons of food, exchanged gifts, and everyone stayed the night for a massive grown-up slumber party that lasted until almost 4 a.m. for some. The kids had a blast entertaining Daisy, and Daisy had so much fun opening presents and hanging with her cousins. After breakfast, we loaded the car to the brim and headed to my mom’s house for more holiday cheer. The girls (my mom, sister, niece and I) went for our annual Christmas Eve mimosa manicures (we take a bottle of champagne for mimosas, but leave out the OJ. You feel me? ), then we all went back to her house for a relaxing dinner and some cocktails. My sister and her family came over for a bit, and we opened and put on our matching PJs (a Christmas tradition since we were kids). 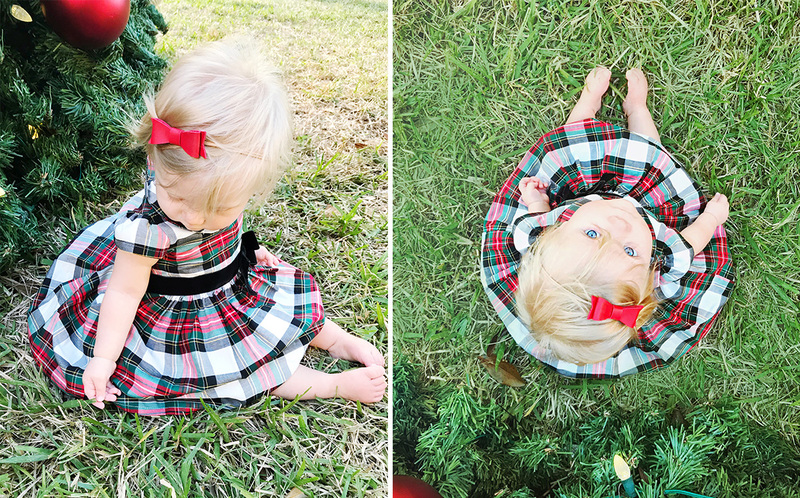 My mom always surprises us with these … we never know if they’re going to be cute, silly, or practical – this year the girls were elves and the guys were Santa! Christmas day was incredibly chill and relaxing. My sister and her crew came back over after Santa, we opened presents, drank Mom’s yummy holiday cocktail (I’ll have to share the recipe later this year! ), snacked, and stayed in our pajamas ALL day. 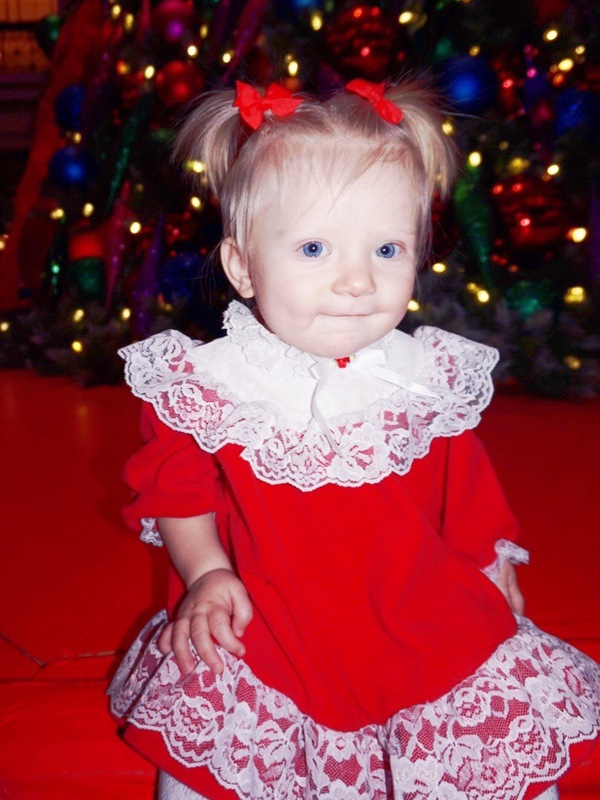 Daisy had so much fun playing with the bows and tissue paper, climbing on the presents, and playing with her new toys. It’s so much more fun doing this with a kid! Unfortunately Daisy and I both decided to catch a cold on Christmas, so my week off work was spent snuggling with her on the couch instead of cleaning the house and prepping for our trip to Chicago. 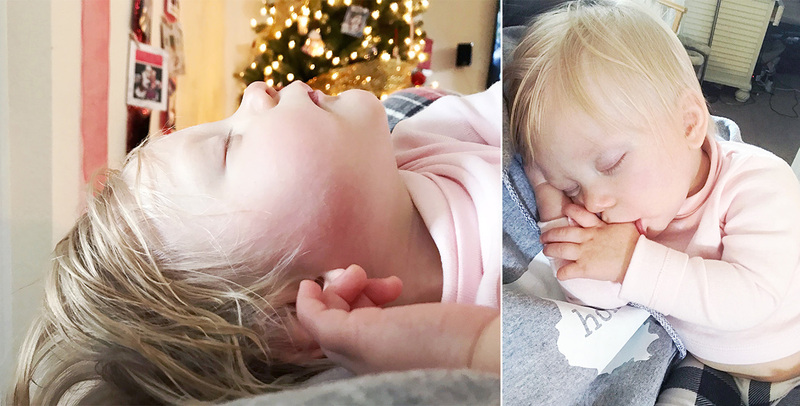 No complaints here though – those snuggles and naps together were completely worth the stacks of clean laundry piled in our bedroom that still need to be put away. We left Saturday, December 30th for Chicago, where we spent the next five days. Daisy was a rockstar on the first four flights she went on, but this one … not so much. Not sure if it was the cold, her ears popping or what, but she was 100% “that baby” on the plane and screamed for basically all 2.5 hours of it. Super fun. She was also sick (as was I), the majority of the trip which sucked, but we still made the best of it. 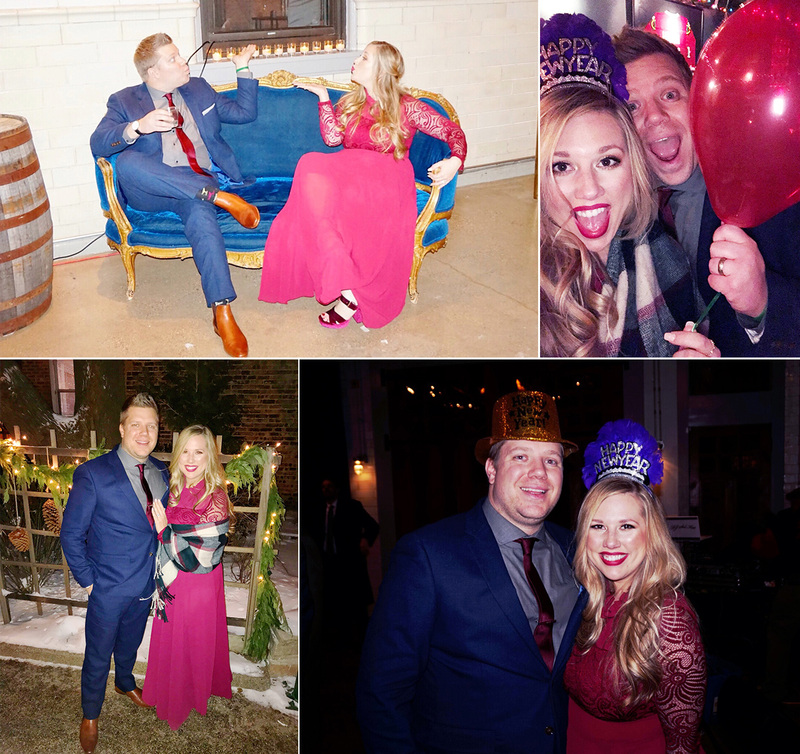 One of Jimmy’s best friends was getting married on New Year’s Eve, so we braved the -11-degree windchill for the rehearsal dinner Saturday night, and again for the wedding on Sunday. Totally worth it though – the wedding was absolutely beautiful and so much fun (congrats again, Tabitha and Lawton)! The rest of our visit was still freezing (because we decided to visit during the coldest week EVER!) but we sucked it up and this southern girl didn’t complain once. We explored Wicker Park (where Jimmy’s sister lives and where we stayed), ate lots of food, and drank lots of booze. On Tuesday we went downtown and saw the Christmas tree, had dinner at The Walnut Room inside Macy’s, and I finally got to have a Tom and Jerry from Miller’s Pub (Jimmy talks about these every single Christmas!). I was so excited to see all the beautiful snow on the ground, and even more excited when snow actually fell on Wednesday before heading home. 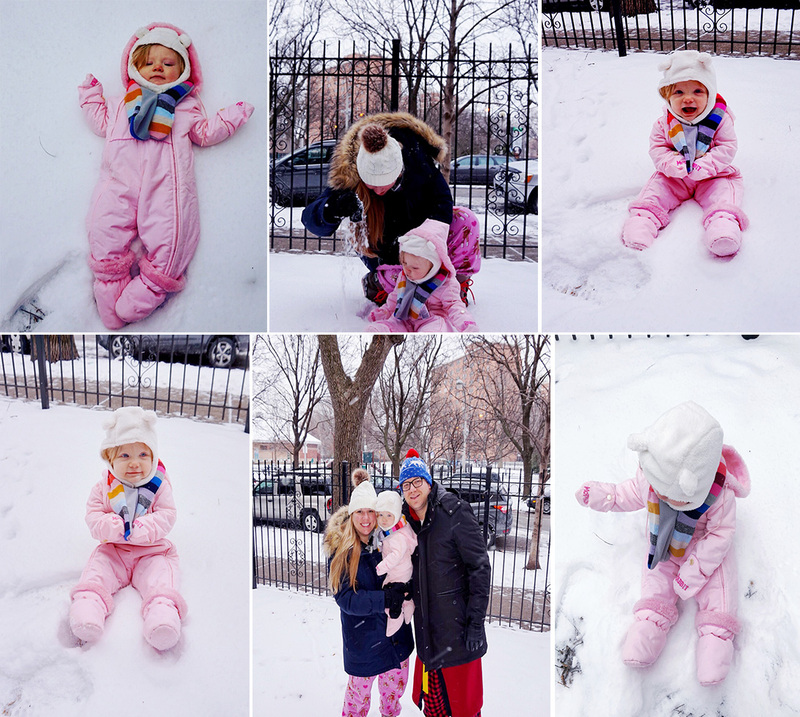 I made us all bundle up over our PJs at 8:30 a.m. and go outside so Daisy could experience her first snow! She loved it! January has been so non-stop, which is why I am just now getting a chance to update you and post. 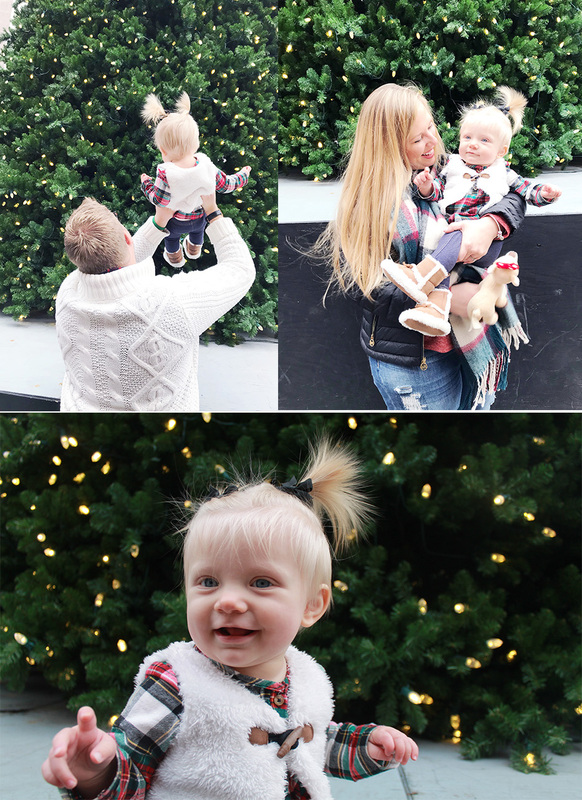 We’ve all been sick off and on, my baby girl turned one last week and celebrated with her first birthday party last weekend (the cutest posts ever on that coming shortly! ), and Jimmy’s parents were in town visiting for the past ten days. We’ve had SO much fun, but I think we’re all exhausted and going to need a month to catch up! Maybe now it will start to feel like a new year :). I hope y’all had an amazing holiday and a happy new year, too! Can’t wait to catch up more, and get back into the swing of things. Lots of fun things coming to the blog for 2018 … get ready!